The Whole Tree Gone - Myra Melford's Be Bread (Firehouse 12 Records) - In the 2+ decades pianist/composer Myra Melford has been on the contemporary music scene, she has created a good number of impressive recordings. With a piano style well-versed in both the blues and avant-garde as well as studies that have taken her to India and beyond, her music is truly her own. This latest disk features a smashing sextet including Ben Goldberg (clarinets), Cuong Vu (trumpet), Brandon Ross (acoustic guitars), Stomu Takeishi (acoustic bass guitar) and Matt Wilson (drums) and it's truly a group recording. Melford has a way of orchestrating "group" arrangements that makes the music, at times, sound bigger. Each piece stands on its own, with sections that allow the musicians to move easily and creatively through the music. To these ears, many of the pieces have a Brazilian influence, in the long, well drawn, melodies and the smartly-crafted dynamics (there are moments that are so quiet one must lean into the speakers.) Ross's acoustic work is crisp, forceful, contemplative and commands the listener pay close attention. His long abstract unaccompanied solo on "Moon Bird" leads into a slow, introspective, solo from Vu (whose playing is solid throughout.) Goldberg's clarinet voice works well within the ensemble, a softer color next to the sharp trumpet, rippling piano and Ross's crackling guitar. Goldberg's lines fly over the roiling, rhythmical, piano on the title track, a work with wide shifts in dynamics and mood. Wilson truly pushes the soloists in the faster sections as Takeishi's swift bass lines act as the anchor. The group interplay on "I See A Horizon" is arresting, the rhythm section pushing the volume and the leads moving, really dancing, within the piece. "On The Lip of Insanity" glistens with melodic invention, a musical chess match in which each player moves the piece along - Vu's solo over the tolling piano chords and the hard-edged drums has great power and dynamic force yet the piece remains a ballad throughout. Melford can play hard and fast with the best of them, with knuckle-busting phrases that jump out at the listener, short solo sections that are stunning for their power and rhythmic fire. Yet, she also displays a melodic grace and creative sense of wonder. "The Whole Tree Gone" is beautifully recorded, intimate, music that opens with each listen - take the time to listen to how each musician works within the compositions and enjoy the interaction. For more information, click http://firehouse12.com/firehouse12_records_release.asp?id=79354 or go to www.myramelford.com. 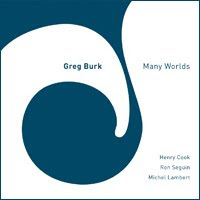 Many Worlds - Greg Burk (482 Music) - Pianist/composer Burk takes a similar approach to his quartet's endeavor as does Myra Melford. Many different elements make up this program, with the emphasis on group interaction and a creative intensity that elevates the music. Bassist Ron Seguin's "Sonny Time" opens the disk, hearkening back to the music of the classic John Coltrane Quartet (save for multi-reed player Henry Cook's flute.) Drummer Michael Lambert provides the muscle and Burk the sheets of sound. He's most often a percussive pianist and his interactions with Lambert keep the listener's attention throughout. The drummer contributes "Storm Cloud", with its eerie flute sounds (provided by Cook on the washtint, an end-blown flute from Ethiopia.) The piece feels like the moments before a late summer deluge, just as the wind has picked up and loose leaves are skittering aross the landscape. In interviews, Burk refers to his band's creations as "rubato music", with "a way of approaching rhythm that doesn’t involve a fixed pulse." That's true, yet you have lovely works like "Look to the Lion" that rise out of the rubato, with a loping gait that dances with grace and serenity. "Many Worlds"contains an intensity that is shared among the 4 musicians, who did not come together to just play "the changes" or show off their "chops" - instead, this fine recording demonstrates the results of working together and trusting each other to create music that is expansive, highly emotional and free-spirited. To find out more, go to http://www.482music.com/albums/482-1063.html.